Implants A natural tooth consists of a crown (the part you see above the gum), and the root (the part hidden under the gum). It is the root in the jawbone that in fact holds the natural tooth in place. Osseointegrated dental implants are the state of the art in modern dentistry. They are small titanium "fixtures" that replace the natural root of the tooth. Gently implanted into the bone, using local anesthetics, these very tiny titanium roots bond or integrate with a patient's bone, stronger than natural root would. 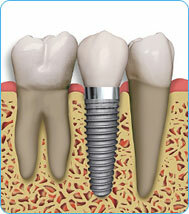 Often, the osseointegrated implant is more stable than a natural tooth's root. Upon these implants, a prosthodontist can build permanent teeth, custom designed and shaded to aesthetically suit the patient's distinctive facial character. Implants could also provide additional support where teeth are missing without exerting forces onto remaining natural teeth. They may be used to support the replacement of a single missing tooth or a complete functional set for individuals who have lost many or all of their teeth. Contact our friendly team on 09 489 7574 today for more information or to make an appointment. Omar is amazing, he is not only a talented dentist, he is also very caring and compassionate.